FNBIndy is addressing two crucial social problems, hunger and lack of access to nutritious food for certain parts of the population, while creating a platform for people to propose projects, take on leadership and solve social issues. For Xander, it has been remarkable to see some of his friends, one of whom was homeless when they first met, gain housing, food security, and become empowered to better their situation through FNBIndy. He confesses that his own diet and nutrition has improved, since, as a low-wage earner and student, he typically couldn’t afford the vegetables and produce needed for a balanced diet, but that, by learning how to cook and grow food, he not only eats well, but is able to feed those around him. One of his current biggest accomplishments is organizing over 90 community meals with FNBIndy and hosting over a dozen events in the year and a quarter since the organization has been active in Indianapolis. Xander is also part of a psychedelic afro-beat band funk/rock/dance band, Sweet Poison Victim (SPV), named after a Ghanaian tradition of sharing a drink called Sweet Poison, which aims to unite the local community in song and dance. SPV was started by Kwesi Brown, who is originally from Ghana, but came to the U.S. to get a master’s degree in ethnomusicology. Kwesi grew up torn between the Christian faith and the traditional religion of his ancestors. His grandmother is a traditional priestess and his father was a Christian preacher. Kwesi became interested in music through worshiping at his grandmother’s shrine and gradually developed his musical taste, which he currently expresses through SPV. Xander currently plays the trumpet in SPV and is proud to be part of the band. Apart from FNBIndy and SVP, Xander is also active in a worker-owned cooperative to educate the public on communication strategies for a community-driven media, to facilitate asset-sharing between artists, socially-conscious non-profits and organizations, and to distribute and produce creative content for these groups. He is also active in Indianapolis Moral Monday Movement, based off of North Carolina’s Moral Monday strategy. Launched by Rev. Barber, the Movement aims to defend voter rights, especially for people of color, women, immigrants and the elderly, as well as to promote progressive policies, while fighting back against increasing efforts to destroy worker’s and women’s rights. He further stressed: “Relationships are the driving force of any social movement or change, and it is by forming deep relationships out of love, respect, mutual aid and solidarity that we will educate, agitate and organize our society into a more egalitarian and sustainable world.” He believes that “we realize our lives are intrinsically connected to the lives of those around us, it’s easy to see that if we make sure everyone in our vicinity is cared for, we’ll be cared for too.” In this vein, the young changemaker would like to see more people step out of the isolation that he believe society encourages and realize how it is possible to have security and comfort if everyone in society works together to take direction action to solve common needs. The young changemaker is convinced that every individual, through his relationships and existence, can help lay the crucial groundwork needed to take advantage when opportunities for sweeping social change arise. Any action matters, from starting a relationship and sharing meals with someone you normally wouldn’t to launching a community garden. One of the practical ways through which Xander is applying his vision and bringing social change is by living in a housing co-operative, called No Limits Housing Co-op, with eight other people. 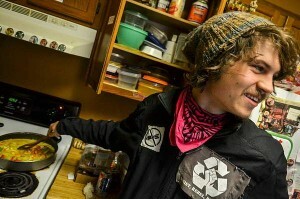 According to Xander, a housing co-operative is a form of group-ownership and also a way of living in an intentional community that models and seeks to exemplify co-operative living practices and permaculture, or, simply put, living in harmony with one another and the land around us. While there are growing numbers of housing co-ops nationwide, his is one of the few in Indianapolis and Indiana in general. Xander and his housemates reduce the food costs, by buying in bulk together, and make other important house decisions in weekly meetings aimed at building consensus on how to ideally live as a community. The housing co-op houses skill-shares and cultural programming for the general public as well. Xander’s first experience living in a co-op was in Madison, WI, where he learned cooking and eating with huge groups of people. With such emotionally-demanding work, Xander finds it sometimes hard to practice good self-care and not over-invest himself. He is working on it though, as he has realized that taking time to care for oneself is the first step toward supporting anyone else. Some of his long-term goals include sustaining himself and his community by following his vocations, being a positive force in the lives of others, having no boss, but having security.